The holiday season will soon be upon us and once again, we are already starting to plan ahead in regards to Christmas gatherings. Unfortunately, trying to tackle the catering requirements of these events can be slightly tricky and there can be times when you are entirely unsure where to begin. Let’s tackle this issue by taking a look at some interesting party catering concepts as well as why Le Frog Catering is able to take the guesswork out of the equation. There is no doubt that Christmas is a memorable time of the year. Why not add this very same timeless essence to your party through the use of a bespoke theme? The ultimate decision will depend upon your tastes and yet, there are countless potential options to choose from. 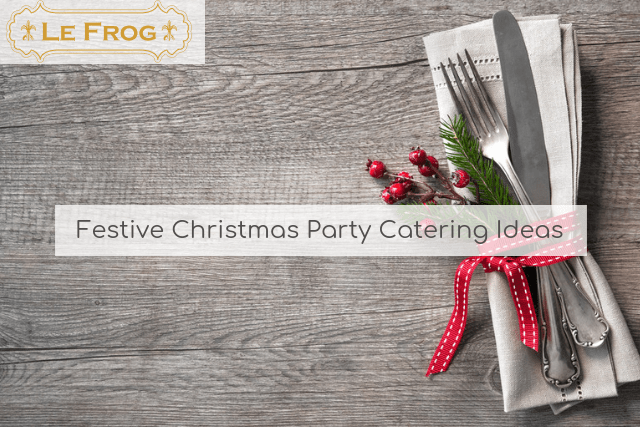 Whether referring to a laid-back gathering with a “Silent Night” theme or a more festive party based around a buffet-style menu, there is no doubt that your guests will appreciate such an effort. Colour should always play an important role during a Christmas gathering, and we are not merely referring to the tablecloths and nearby flower arrangements. One of the best catering ideas is to incorporate seasonal tones into the food itself. Reds, greens, whites, and browns can all be chosen; a great way to celebrate the season with a touch of visual flair. Keep in mind that matching such tones to the nearby surroundings will tie together the entire atmosphere. Although there is nothing wrong with serving up traditional Christmas foods such as sliced ham and cranberry sauce, you might instead wish to provide your guests with a more eclectic menu to choose from. Not only can this be a great idea to spice up the event itself, but you will be able to cater to different tastes. It could be wise to send out a questionnaire in advance in order to determine what that majority of your attendees desire. The best way to effectively tackle the suggestions mentioned above is to hire a private chef in Bristol. Not only will the meals be cooked to absolute perfection, but you are not required to worry about issues such as preparation or cleaning. You can instead sit back and absorb all that this magical time of year has to offer.